The highly ambitious dream of India's first high-speed bullet train which would run between Ahmedabad and Mumbai is close to becoming a reality. According to Piyush Goyal, Union Railway Minister,the operations for this project will commence from 2022. Though bullet trains will usher a new era of growth and development but the investment capital is humongous. In this backdrop, the issue becomes highly debatable and may appear in GD of some B-schools. The article below has been written to throw some light on the project, key statistics and its pros and cons. The Indian Ministry of Railway prepared the “Indian Railways Vision 2020” in December 2009, and proposed seven routes that are candidates for the construction of high-speed-railways or Bullet trains.The line between Mumbai and Ahmedabad (approximately 500 km long) has been declared as the first high-speed railway section to be planned and constructed. The High Speed Railway Line (HSRL) will connect Mumbai, the capital city of the State of Maharashtra and the second most populous metropolitan area in India with Ahmedabad which is a metropolis in the State of Gujarat. The approximately 500 km long line will consist of High-speed Railway vision running along the Arabian Sea coast side and connecting with Surat and Vadodara en-route which are the second and third largest city in the State of Gujarat. The proposed High Speed Railway corridor between Ahmedabad and Mumbai aimsto improve connectivity between the two business centers and make it more easily connected. On 7 October 2013, India and Japan signed a Memorandum of Understanding (MOU) for joint feasibility study on the construction of HSR between Mumbai and Ahmedabad. The estimated Cost for the entire corridor is Rs.1, 08,000 Crore. Japan has offered a loan of Rs 97,636 Crore to fund about 81% of the project at an interest of 0.1%. The repayment period for the loan is 50 years,beginning from the 16th year of operation. There will be 12 stations on the route. The majority of the route will be elevated. A part of it will run through a 7 km long undersea tunnel. The Maximum Design Speed of the train will be 350 kmph and Maximum operating speed of will be 320 kmph. High-speed connectivity:India is a vast country and the need to travel faster has become a necessity. While air transport can cater to such needs, the capacity that it offers simply cannot match that of the railways. While making incremental changes to improve existing infrastructure is desirable, it is equally important to adopt proven state-of-the-art technologies.The High Speed Railway Line will be effective in meeting this requirement. Apart from diverting passengers from road and air, Bullet train generates a new class of passengers as well. With the average operating speeds higher than 250 km/h, High Speed Railways willmakethe distance of 500 km reachable in two hours. Less stress on the Railways: The conventional Indian Railways lags substantially in extending, accelerating and modernizing its infrastructure and services. There is a serious need tosegregate its passenger business from freight. With advent of bullet trains the stress on the railways would be reduced. Employment: The bullet train project is expected to create 4,000 direct job opportunities, along with 20,000 indirect jobs. 20,000 construction workers will also be employed during the set up period of Ahmedabad-Mumbai bullet train. Urban expansion: New bullet train stations set to come up along the route will attract urban growth. This will again shift the pressure of urbanization from the existing urban centers. Environmental: In the backdrop of increasing concerns over environmental pollution and degradation of fossil fuels, energy-efficient and environmentally friendly, high-speed electric trains emit an eighth and a fifth of carbon dioxide as against automobiles and airplanes per passenger km, respectively. Enhanced Safety: High Speed Railways’ safety record is remarkable. With a 2,500-km network, providing high frequency, up to 14 trains per hour, the Shinkansen/Bullet train ever since its inception has maintained a unique record of no fatal accident. 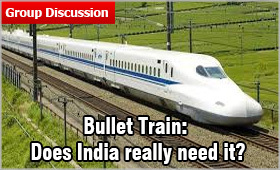 Other avenues: The prime purpose of Bullet trains in India to provide convenience to commuters. However, it can also make a difference in freight transportation. Be it courier mail services, perishables, or other items, any fast alternative to overloaded lorries should be welcome for businesses as well as private consumers. A project report by the Indian Institute of Management, Ahmedabad estimates that at least 1 lakh passengers at fares approximately Rs. 1,500 per 300 km would be required daily for the project to break even. The cost of air fare between the two cities is around Rs. 2,500. With comparable fare to air ways the project doesn’t seem to serve the purpose. The complexity of the project also arises due a variety of socio-economic implications like land acquisition, rehabilitation, and environmental concerns. Bullet train project in India would be a massively expensive involving enormous public expenditure that India cannot afford as a huge public investment is needed in social infrastructure and poverty eradication. With majority of Indian population travelling in sleeper class or lower class for thousands of kilometers the project will be benefiting only international corporates, local contractors and a small number of aspirational elites indulging in luxury travel. With the advent of new technologies like Hyperloop Transportation Technologies which propose to make travel as fast as 760 miles per hour, investing a humongous capital on bullet train seems a cursory and outdated. The above discussed topic is one of the most talked about issue; therefore it has been carefully chosen and solved with the sole aim to help you succeed in GD round. If you follow the few key tips, you can improve your chances to get through the GD round.